It’s just a little more than a week away. If you’re on the lookout for resources for yourself, your kids or your parish or school, take a look at these. There are a few used copies of The Power of the Cross on Amazon . This booklet was published in 2017 for Lent 2017, but even though the specific readings aren’t the same..hey, it’s all still Lent. It was published by Liguori, also available in Spanish. Kindle version of English booklet. Paper version. Still time to order with Prime. The Spanish-language version is not available in a digital format, but here is an Amazon link, and yes, you can get it soon via Prime. Contact Liguori at 1-800-325-9521 for parish and school orders. No promises, but they can probably get orders to you by next week. Also – some older posts on Lent – feel free to link and to take the graphics and use as you wish. Pre-Lent. Quinquagesima Sunday is this coming Sunday. More on this traditional season here in my post. 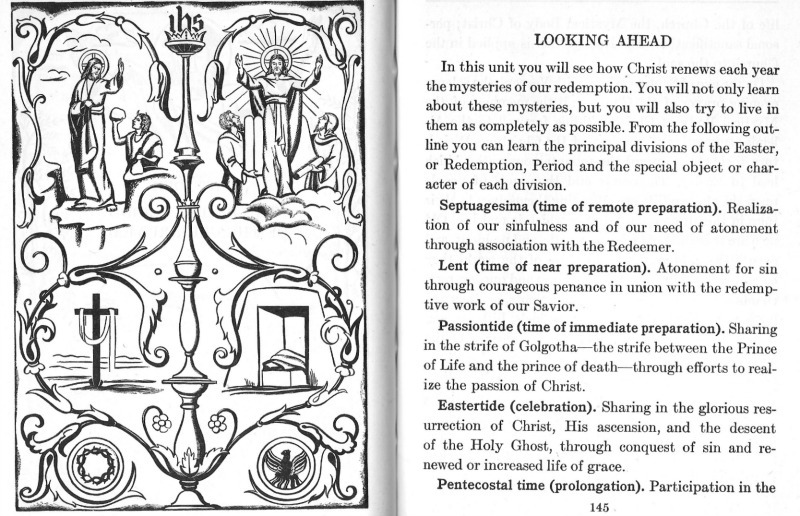 The New Liturgical Movement has published an excellent series found here. St. Robert Bellarmine on fasting. I have been on a bit of a hobby horse about pre-Lent. And yes, I am still on it. In reading over some older devotional materials (more on that in the next post) and thinking about this Sunday’s Mass readings, the problem (one of them) clicked into place in a very simple way. Lent begins next Wednesday, Ash Wednesday. Which means tomorrow is the last Sunday before Lent begins. What are the Mass readings? They are the readings of the 7th Sunday of Ordinary Time. Gospel:: Matthew 6, continuing our reading of the Sermon on the Mount which has been going on for a couple of weeks. How about last year? The last Sunday before Lent began was the Fifth Sunday of Ordinary Time and the Gospel – calling of Peter, etc. from Luke. And before that? 2015 – 6th Sunday of Ordinary Time, Gospel – healing of a leper from Mark. Quinquagesima Sunday readings, the Sunday before Ash Wednesday, everywhere in the Catholic world before the Second Vatican Council? At that time Jesus took unto Him the twelve and said to them: Behold, we go up to Jerusalem, and all things shall be accomplished which were written by the prophets concerning the Son of Man. For He shall be delivered to the Gentiles, and shall be mocked and scourged and spit upon: and after they have scourged Him, they will put Him to death, and the third day He shall rise again. And they understood none of these things, and this word was hid from them, and they understood not the things that were said. Now it came to pass, when He drew nigh to Jericho, that a certain blind man sat by the wayside, begging. And when he heard the multitude passing by, he asked what this meant. And they told him that Jesus of Nazareth was passing by. And he cried out, saying: Jesus, son of David, have mercy on me. And they that went before rebuked him, that he should hold his peace. But he cried out much more: Son of David, have mercy on me. And Jesus standing, commanded him to be brought unto Him. And when he was come near, He asked him, saying: What wilt thou that I do to thee? But he said: Lord, that I may see. And Jesus said to him: Receive thy sight, thy faith hath made thee whole. And immediately he saw and followed Him, glorifying God. And all the people, when they saw it, gave praise to God. So the entire Catholic world would hear these Scriptures , not just whatever happens to be the readings of that last Sunday of Ordinary Time, but these Scriptures (and Propers and prayers) specifically and organically evolved with the coming of Lent in view. In that older post I highlight the work of scholar Dr. Lauren Pristas, who wrote an essay detailing the thought and politics that went into the elimination of pre-Lent in the Latin Rite. As I say there, the conclusion is essentially that it was too hard for us poor lay folk to keep it all straight and stay focused. Unintended consequences, anyone? Not to speak of weirdly wrong thinking. Pistas entitled her essay “Parachuting into Lent” and that is exactly the effect, isn’t it? The best-intentioned post-Conciliar reformers (in contrast to those who simply didn’t believe any of the stuff anymore) seemed to me to be operating from the assumption that the Church’s life and practice as it had developed over time functioned as an obstacle to deeply authentic faith, and that what was needed was a loosening of all this so that Catholics would develop a more adult faith, rooted in free response rather than adherence to structures. Well, you know how it is. You know how it is when, on one day out of a million you have a blank slate in front of you? No rigid walls hemming you in? No kids to pick up, you don’t have to work, no one’s throwing obligations and tasks at you? And you think, Wow…a whole day free. I’m going to get so much done! And then it’s the end of the day, and you realize that maybe what you had thought were restrictions were really guides and maybe not so bad because you look back on your Day Without Walls and you wonder…wait, how many cat videos did I watch today? Do I even want to know? (This is a reprint of a post I did last year – but the issue is naturally coming up again since the pre-Lent season, of which this will be the final Sunday should begin tomorrow – and is, if you celebrate Extraordinary Form or Ordinariate! , so here it is..again. It’s bizarre for many reasons having to do with the normal reasons of upending tradition via committee work, but also because it’s such an unecumenical move, and, on paper at least, Vatican II was, we hear, informed by ecumenical concerns. In three weeks our heads will be marked with the ashes of penitence. A special time of preparation for Lent emerged in the liturgy of the 6th and 7th centuries. The three Sundays preceding Ash Wednesday were called Septuagesima, Sexagesima, and Quinquagesima, meaning respectively, the seventieth, sixtieth, and fiftieth days before Pascha. The First Sunday of Lent is, of course, Quadragesima, the beginning of the Lenten fast of forty days. 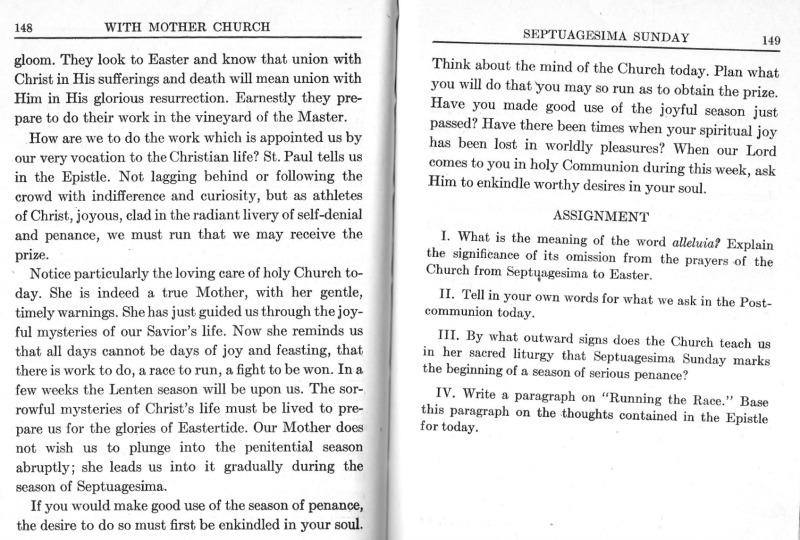 Septuagesima Sunday is the ninth Sunday before Lent, and it is the day on which the Septuagesima season of preparation for Lent has begun for more than 1,000 years in the traditional calendar. The Septuagesima season is made up of three Sundays: Septuagesima (which means seventieth), Sexagesima (which means sixtieth), and Quinquagesima (which means fiftieth), and it extends until Ash Wednesday. Beginning with Compline (Night Prayer) on the Saturday before Septuagesima Sunday the Alleluia, Gloria, and Te Deum are not said any more until Easter. Two extra Alleluias are said at Vespers on that Saturday. In some places charming ceremonies have been practiced in which an Alleluia is put in a little coffin and buried, to be resurrected again only on Easter Sunday. Throughout Septuagesima, violet vestments are worn, except on feasts observed during weekday. 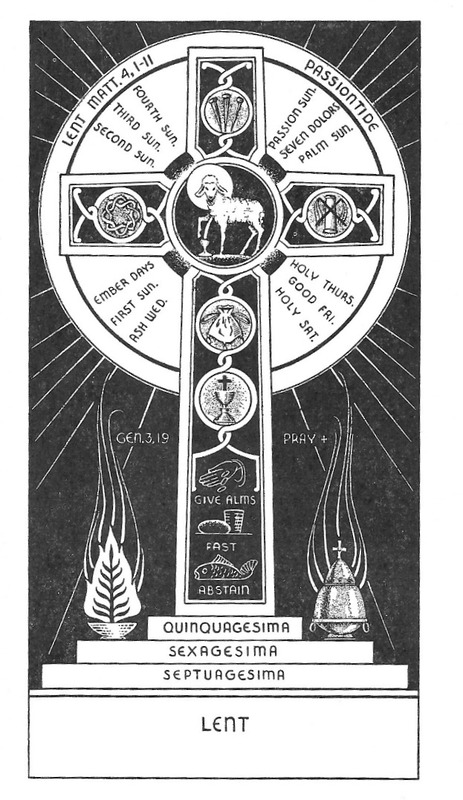 Septuagesima and the following days are observed in Anglicanism and in some Lutheran groups. The Eastern Catholics and Orthodox of course observe pre-Lent, described very well here at the Aquinas and More Bookstore site. The point being…Lent calls for preparation. And while it’s all well and good to look at the calendar, wonder, “Hey, when is Ash Wednesday this year?” And then say, “Yikes…that’s soon! Okay. Start thinking. What am I going to give up?” …well, what these traditional preparation-for-the-preparatory seasons do is to set the fact of that realization and need to prepare into a deep context that is wise, rooted in the richness of tradition , and helpful. Thousands and thousands of people upon the stage of lief are adjusting themselves to their roles in this drama — this drama which is real life. Old men are there and old women, youths and maidens, and even little children. From all parts of the world they come and from all walks of life — kings and queens, merchants and laborers, teachers and students, bankers and beggars, religious of all orders, cardinals, bishops and parish priests, and leading them all the Vicar of Christ on earth. All are quietly taking their laces, for all re actors in the sublime mystery drama of our redemption. We, too, have our own parts to play in this living drama. And there is no rehearsal. 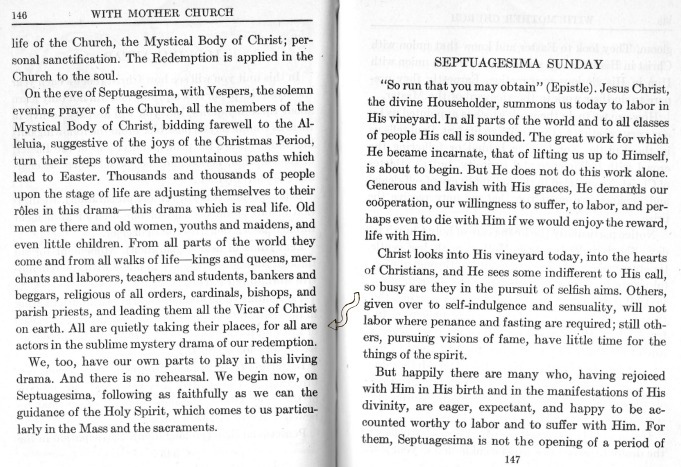 We begin now, on Septuagesima, following as faithfully as we can the guidance of the Holy Spirit, which comes to us particularly in the Mass and the sacraments. It would be very clear, wouldn’t it, to the twelve-year old reading this, that he or she is not waiting to be a real, active Christian – the time is now, and the Spirit is active in the lives of all the baptized. Rather stirring, isn’t it? You’re young, yes, but you’re not an extra in this – you are all in. As usual, it was determined that all this was too hard for us. Or the season is abolished and the prayers used in the last three Sundays before Lent. As Pristas points out, the two options that are not there are either making no change at all or abolishing everything, names, prayers, season – which is, of course, what happened. the breviary lessons be moved to Advent, and the Mass lessons be retained in place. The Birth of the Liturgy Committee, right there. Crazy. Look. Church Things come about for all kinds of reasons and out of all kinds of circumstances: good intentions, misguided intentions, evil, persecution and even accidents. The mystery of this dynamic intersection of divine and human ways is one of my abiding interests. In addition, liturgy develops, and while “organic development” is practically impossible to define, it’s also obvious that a handful of scholars from a particular place and time sorting through options for transforming a thousand year-old set of traditions in a way that will profoundly impact hundreds of millions of Catholics, present and future…ain’t it. And perhaps… this example might also remind us – in case we’d forgotten – that there’s no need to view decision-making within Church institutions with piously folded hands that move only to place a finger to the lips while whispering Hush! Holy Spirit at work! All is well!